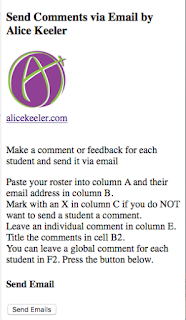 Alice Keeler's add-on - send comments gives you the ability to send multiple users personalized e-mails from one document. 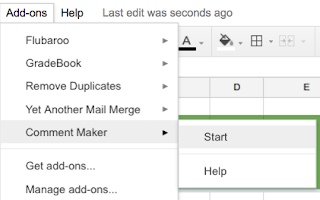 To see a brief video of how to use this add-on - please click on the embedded 1 minute YouTube video below or follow the directions underneath. 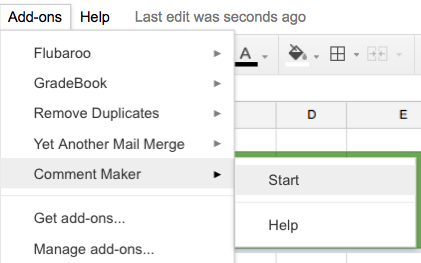 Once you have made a copy of the document (send comments) select Add-ons from the menu and select start. Allow the permissions by selecting continue and then allow on the screen that follows. 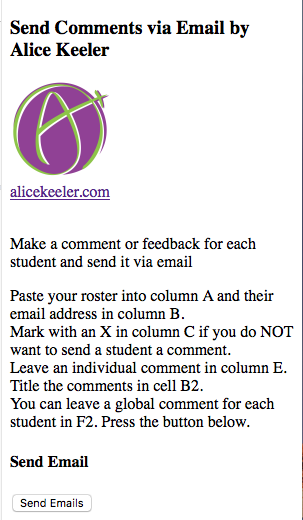 As you can see with the screenshot below you will paste your roster in column A and e-mail addresses in column B (place an x if you do not want to send an e-mail in column C). Column E - leave your comment. For more add-ons, templates, and extensions - please click here (takes you to the section of her site).